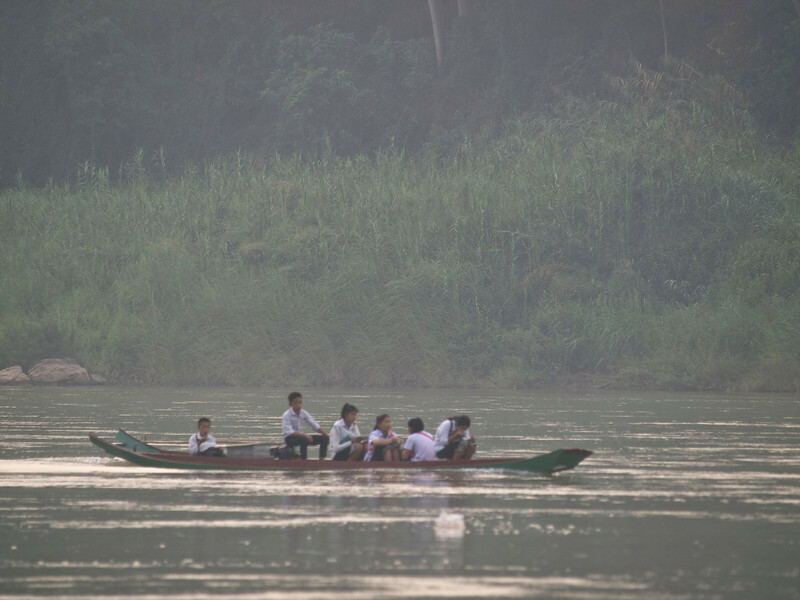 Morning mist shrouds the Mekong as we depart Luang Prabang, commencing a two day boat trip to Houey Xai (pronounced “way-say”). We decided not to go on the $30 public boat. They often put more than 100 people on it. I hear the engine noise is deafening if you are unfortunate enough to be in the rear of the boat and there are not enough seats for everyone. They say to arrive at least an hour early to get a seat but since everyone already knows that, one probably has to get there considerably earlier. Instead we have booked a newcomer to the private boat scene named the Shompoo. Peter, our host the last four nights booked the trip. 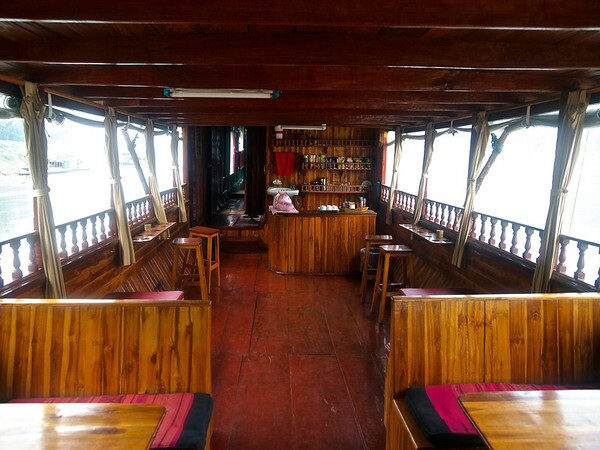 For $129 per person, we are on a beautiful wooden boat with cushioned day beds and banquettes. We get a lunch and breakfast the first day. We are pre-paid into a “comfortable hotel” in Pebang for tonight with dinner and breakfast included and of course tomorrow’s lunch on board is included as well. The three person crew is wonderful and the boat which can carry 14 passengers only has six—sweet! Back to the voyage. It is early morning and for once it is actually cool with a sweet breeze on the river. The mist-enveloped mountains and forest add a surreal dreamlike quality and I am reminded of images of Joseph Conrad, Tony Poe and Francis Ford Coppola. I am “camped” on one of the day beds near the bow (we were lucky and first to board although all seats are good). 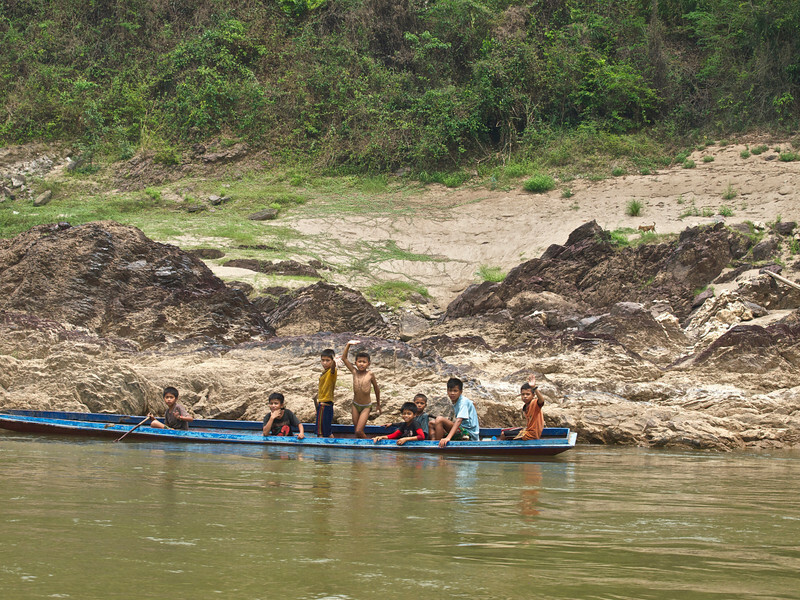 Several small longboats pass with children in their school uniforms headed to classes. I wave. They giggle and wave back. A few fisherman dot the banks along the way. I snap photos switching between lenses trying to get the perfect shots of life on the Mekong. Anna, ever helpful, holds my lenses and converses with the first mate in Laotian (yes she does). We are in like flint. Soon a light breakfast consisting of fresh orange juice, croissants and real coffee is presented. After a cup I am asked if the coffee is too weak or too strong. I politely answer “kop jai” (thank you) “it is lovely.” “Would you like another cup”? “”yes please.” “How would you like it brewed”? “Just a little stronger would be perfection.” And so it is. Another hour goes by and we stop at the Pak Ou Caves. We walk up stairs; the admission has already been paid. 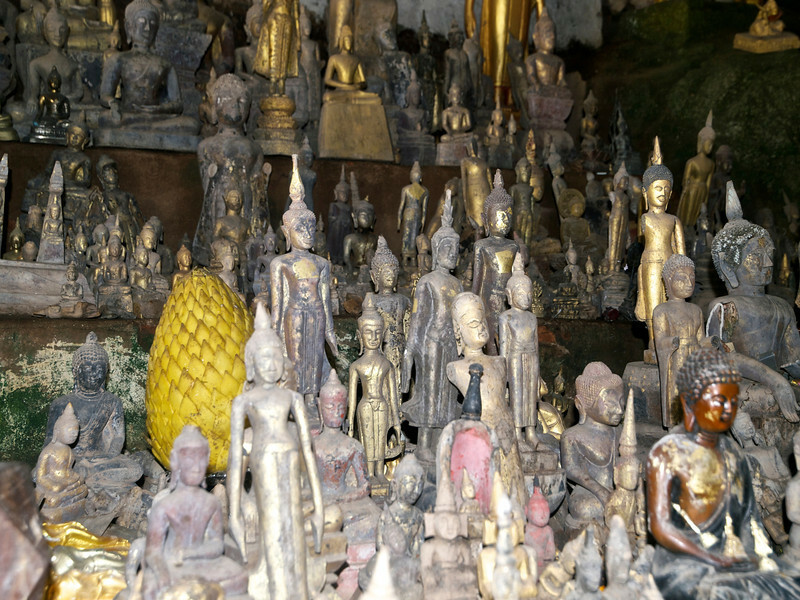 Inside are hundreds of Buddhas. 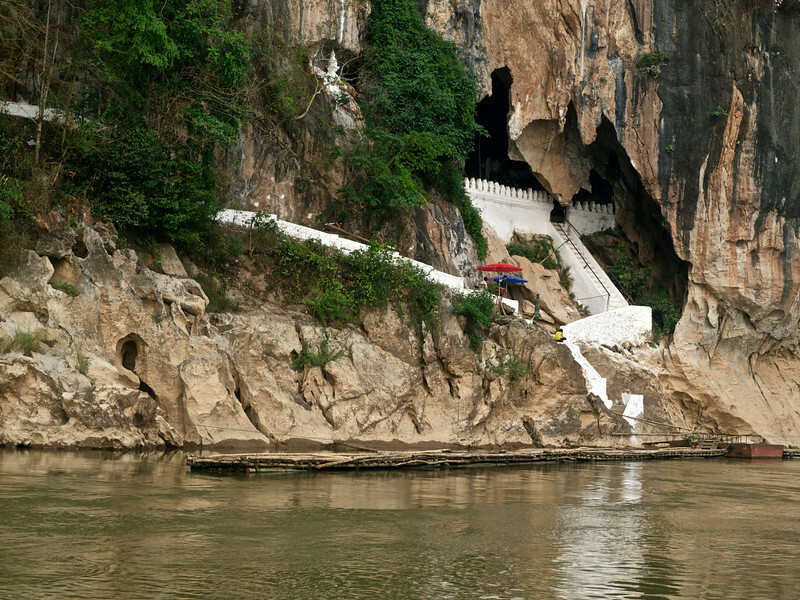 This is a very sacred site and we are told that last week during the Lao New Year, everyone in the region visited this cave complex and participated in cleansing the Buddhas with perfumed water. Anna and I purchase candles and incense and pay our respects. Then we exit and climb 215 stairs to the upper and larger cave complex. I have brought a flashlight but they are available for a small donation at the entrance to the cave. They are needed as there is no artificial lighting inside. 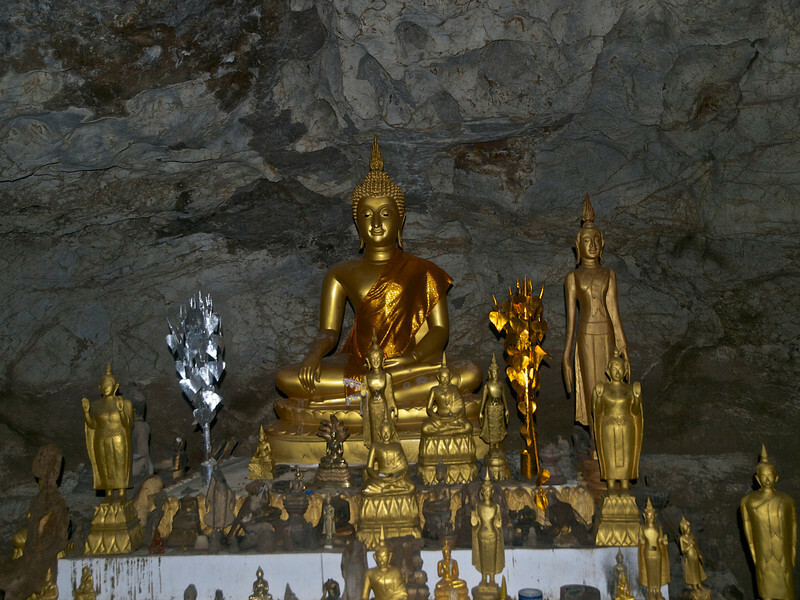 Many more golden Buddhas line the chambers of these caves. The frequencies of accumulated devotion and appreciation are palpable. It is a memorable experience. 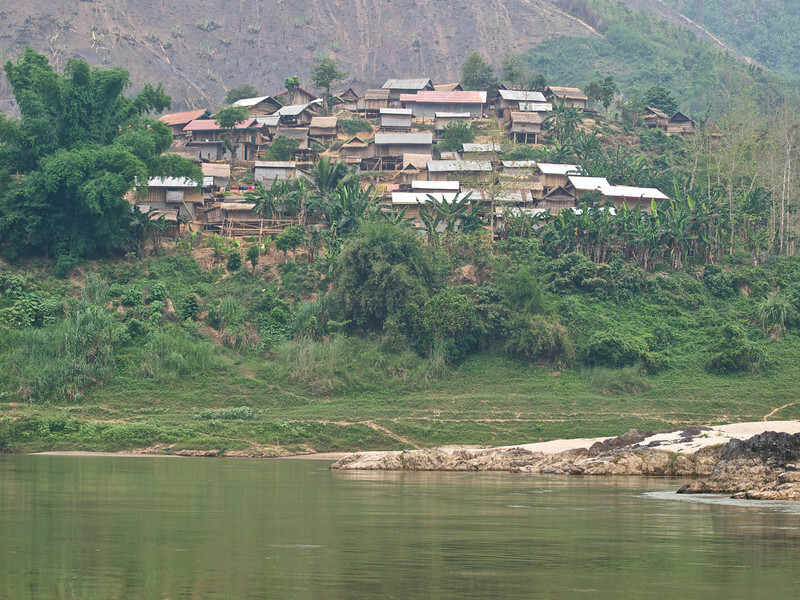 From here we will travel another eight hours up the Mekong to Pakbeng where we will disembark for the night. As I write this it is 9:30 am. The mist has lifted a tad but still hangs around the mountains giving them a soft focus. It is so very peaceful and I am so very glad we chose this boat trip. Lunch was good. Vegetable soup, spring rolls with a sweet and slightly peppery dipping sauce containing diced peanuts, something in a banana leaf, sweet and sour pork and rice. For dessert, fresh watermelon and papaya. Just before lunch we spotted two sun bears beside the riverbank. 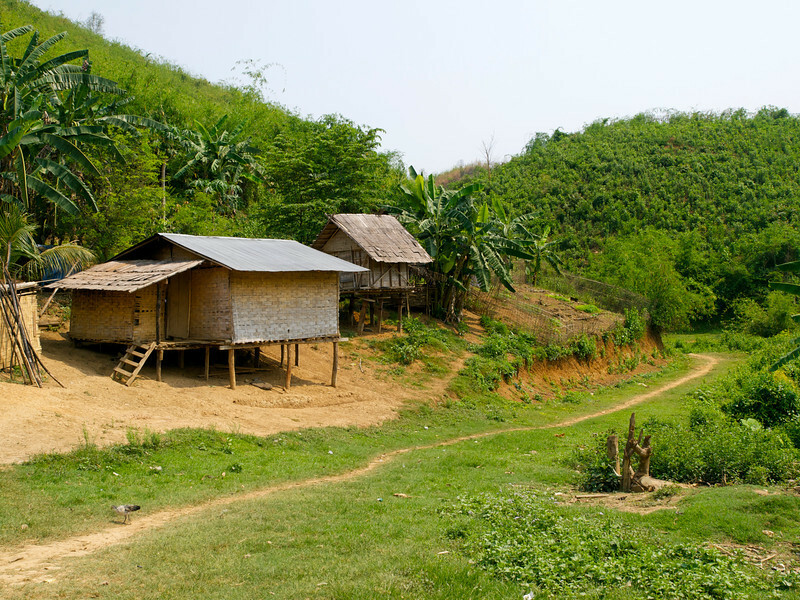 We also pass many water buffalo and groups of hogs along the way. 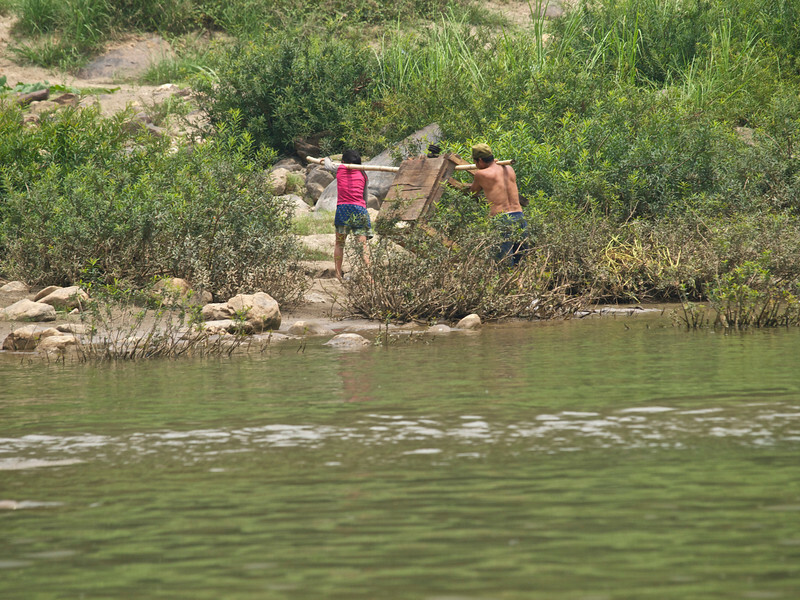 I sink into the rhythm of the river: Children swimming and playing, the occasional village, a woman washing clothes, a man fishing for his family’s dinner. 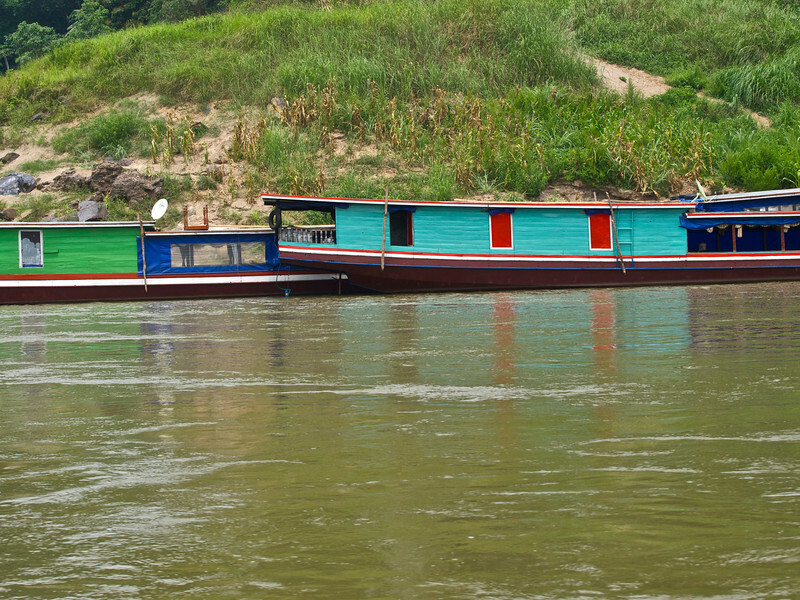 The long boxy boats are used to transport cement and timber. One of the larger ones was bringing meat down from China. 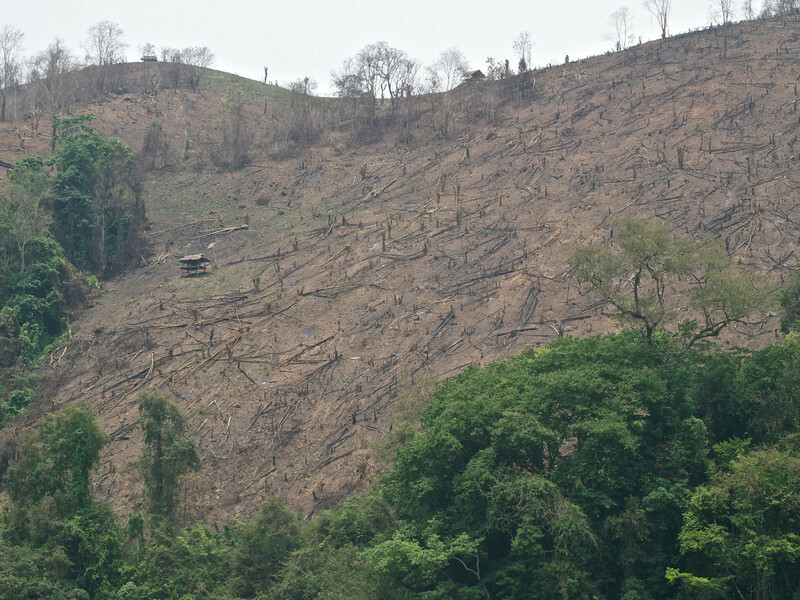 There is a lot of slash and burn timber harvesting along here, almost entirely illegal. One spot I did see replanted but most of it looks burnt and ugly and with the monsoons due any time I fear it will all slide into the river. 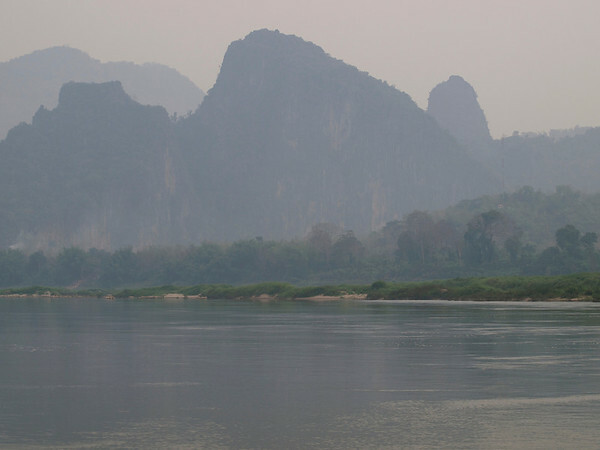 4/25/14—day two on the Mekong. The boat gets out right away at 6:30 am. It is refreshingly cool with a light breeze. After a few minutes a light drizzle begins. As much as I like warm/hot weather, I think I am getting burned out a bit. Of course April is the hottest month of the year in SE Asia and the mercury regularly tops 100°F. List night in Pakbeng was interesting. We arrived on time at 5:00 pm. We got screwed on the Phetsokxai Hotel. The receptionist was antagonistic from the moment we arrived. She did not have our confirmation but she called Alex the tour operator and he confirmed it. When I asked her about the prepaid included dinner, she said there was no dinner. I politely asked her to call Alex back and she had a 15 second phone conversation after which she said, ‘Alex says no dinner.’ Meanwhile, they were setting up a dinner feast on the deck overlooking the river for a group of about 40 Chinese tourists. In the middle of the night the AC stopped working. We would have been ok with the fan but the unit decided to beep constantly after that despite attempts to cut and restore the power. So much for sleeping. In the morning the light in the bathroom did not work so we showered in the dark. I have slept on floors that were softer than the bed and the pillow was a boulder. I would definitely not recommend this place. Oh well, that’s traveling. We walked around the one street town a bit. It was really smokey out from all the burning going on so we were coughing and rubbing our eyes some. We ran into So-Mai the very pleasant steward from the boat and invited him to join us for a beer and some Indian food. Over dinner, we got considerable insight into the problems of a young Laotian man in love when his family does not like his romantic choice. It is not easy! Well, looks to be another pleasant morning on the river. 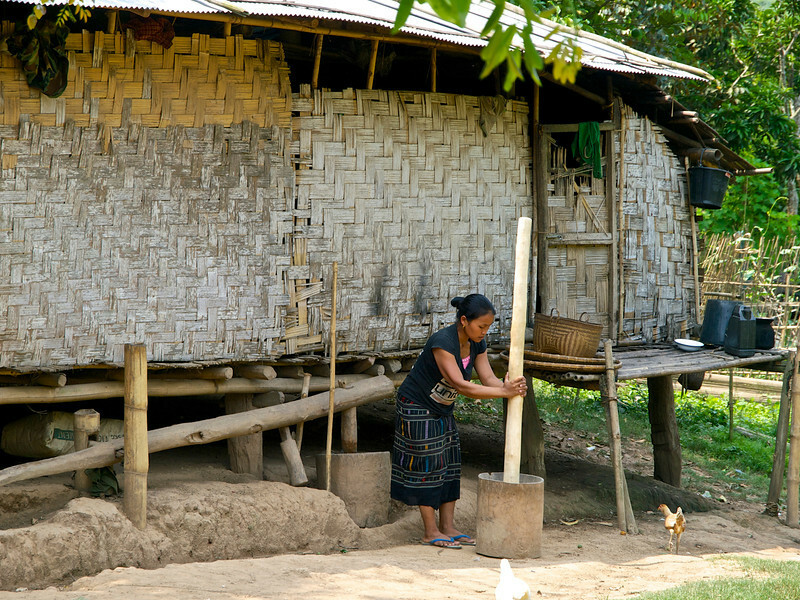 About 10:00 am we stop to visit a Kamu village for about 45 minutes. The residents are friendly and don’t mind having photographs taken. 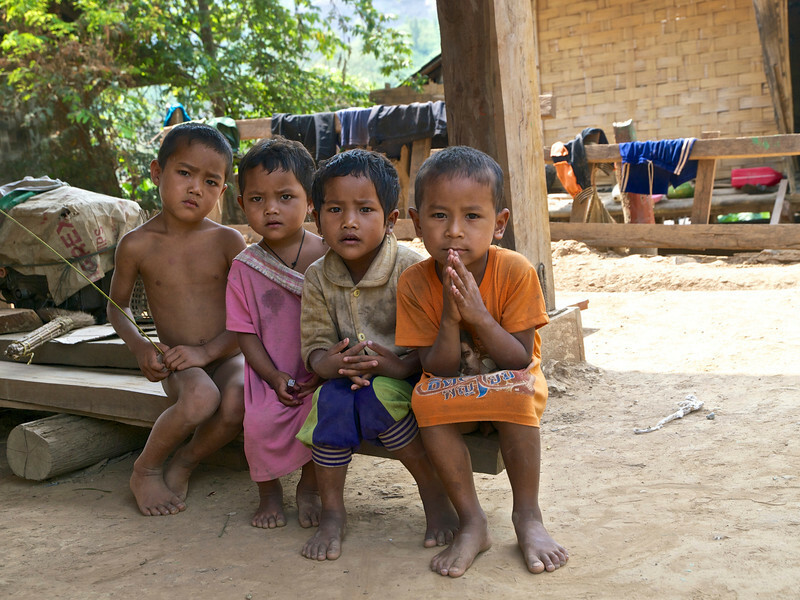 I leave a donation to help with the school they are building. Lunch day two was good again. They even set tablecloths and linen napkins! Today we had appetizers made from minced chicken and spices and formed around bamboo sticks before cooking and then served with a spicy dipping sauce. Then came steamed rice, stir-fried veggies, chicken and a clear soup with veggies. For dessert: banana chunks cooked in coconut milk and honey. 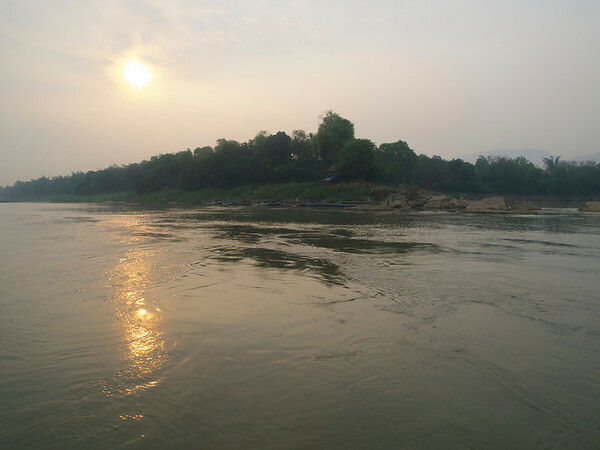 The Mekong begins in Tibet and ends in a large delta n Vietnam. 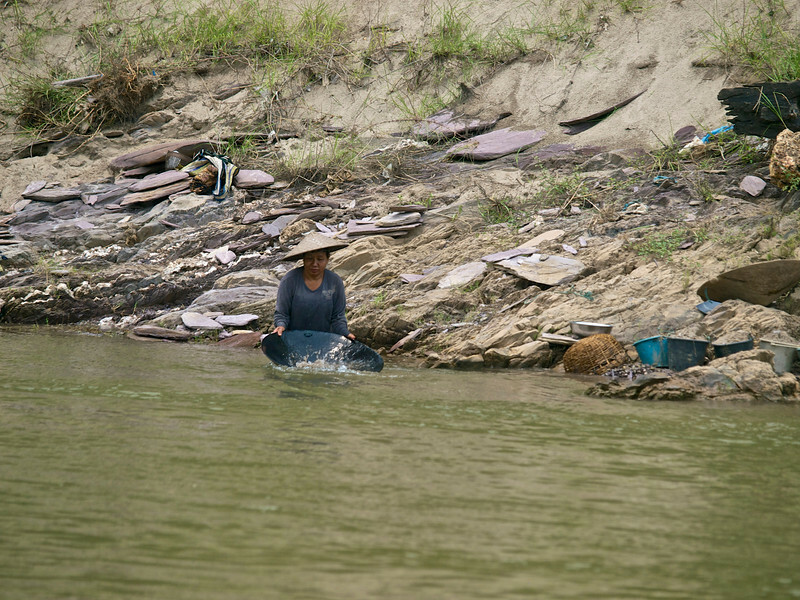 It flows through China, Myanmar, Laos, Thailand and Cambodia as well. It is longer than the Mississippi and at times flows through inaccessible jungles and canyons. Until 20 years ago it had not a single bridge crossing. 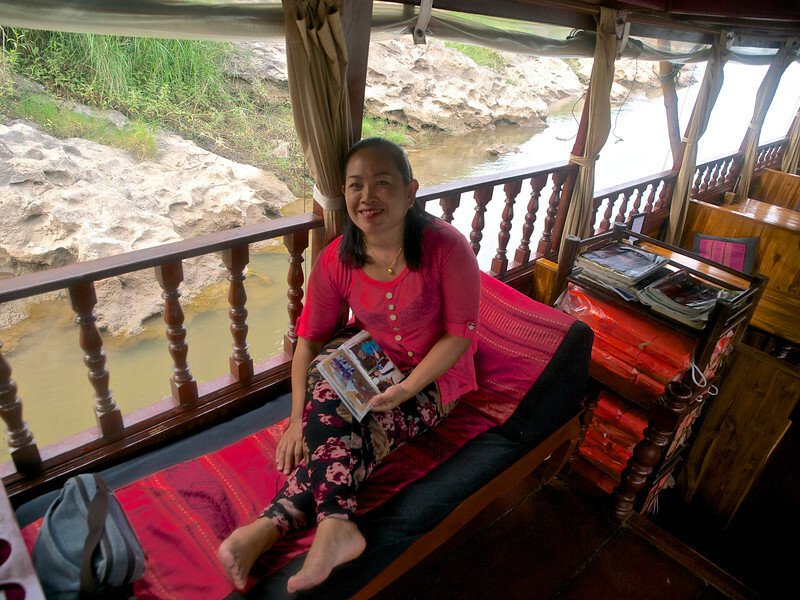 Our two day voyage of ease along the Mekong was soon over and we almost regrettably disembarked. Shampoo Cruise—$115/person includes 1 breakfast and two lunches. You can prebook an overnight room in Pekbang either Budget, Comfort or Luxury. We chose Comfort which raised our cost to $129/person. We were the only people on the boat who ended up at this crappy place. I think some of the other comfort level accommodations are better. One couple stayed at the luxury hotel which would have only been $10 more each. I think it was probably worth it as it looked quite nice from the riverside. I thoroughly enjoyed reading your blog of the Asia trip. It is well organized and very informative. This allows other travelers to see the world if they are unfortunate or afraid to do so. It allows those of us who are fortunate to travel, to decide where they want to go. Your photographs are outstanding! I’m certain I will be rereading these several times before my trip is in place. Thank you for sharing your dream! What a great life! You are most welcome. Please let me know if you have other travel questions I can answer.